I have in front of me an enormous stack of political propaganda. Specifically, I have a copy of every campaign mailer, from both the Democratic and Republican parties, sent to a single household in Georgia’s Sixth District during the run-up to the special congressional election held there in June. It is quite an archive. This one home received over 70 different leaflets over the course of a few months, as Democrat Jon Ossoff and Republican Karen Handel waged an incredibly expensive advertising war for a seat in the House of Representatives. Looking through the mailers, it’s easy to see where the money went. I am still amazed, whenever I spread them out on my desk, that I am looking at the material received by just one family. If you collected all the Handel and Ossoff flyers from the entire race from the entire district, they’d probably stretch to the moon. (Actually, probably not quite that far. If there are 700,000 people in a congressional district, and 2.5 people in the average household, then if every household got 72 mailers the sum total is only 3,000 miles worth, i.e. more than the entire distance across the United States from coast to coast. Still, uh, quite a lot of paper.) 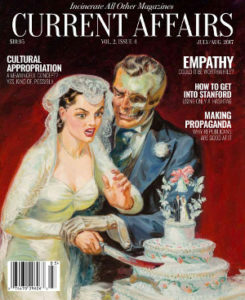 They’re all glossy, all professionally printed and designed, and all, of course, rank propaganda. Leafing through a stack of Ossoff/Handel flyers is a good way to examine the nature of contemporary political messaging. Both parties must have thought assailing people with these things would be effective, or else they wouldn’t have done it. Whether they were effective is another matter, but we can get a good sense of what the parties are trying to do. How do they pitch themselves to voters? What do they think people want from them? Do they treat people like children to be manipulated, or like rational citizens enacting the noble task of democratic participation? Like children, obviously. The Ossoff/Handel flyers seem to assume a voter whose every thought is either a grunt of approval or a grunt of disdain. 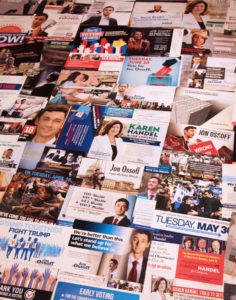 And their theory of persuasion seems to be that voters vote for the candidate who sends them the largest mountain of mailers, regardless of what those mailers actually say. The ads are not just simple, they are for the most part empty of political content. The Handel message was, almost in its entirety: Jon Ossoff is a carpetbagging liberal funded by Nancy Pelosi. The Ossoff message was a little more diffuse. The central themes were: (1) Donald Trump is bad, and Jon Ossoff is not Donald Trump; (2) Planned Parenthood is good, and Karen Handel does not like Planned Parenthood; (3) guns are bad, and Karen Handel wants them to be in your schools; (4) government waste is bad, and Jon Ossoff hates government waste. But that formulation actually overstates the coherence of Jon Ossoff’s campaign mailers. One of the most notable things about them is just how surreally vague many of them are. The messages on some are not just ineffective, they are inscrutable. 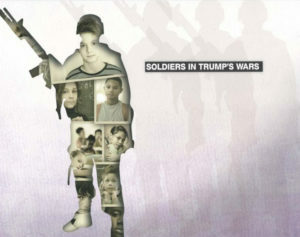 One mailer features photographs of young children arranged inside the silhouette of a soldier, with the caption “SOLDIERS IN TRUMP’S WARS.” It’s mystifying; presumably the flyer is saying that the children are going to be drafted into a war waged by Trump. But won’t Trump’s term of office long since have expired by the time they reach the age of enlistment? What war is being referred to, exactly? The flyer is mysterious; on the back, Ossoff simply says that Trump is dangerous and warlike. Worse, this is the only flyer using the “livable wage” quote against Handel, even though this was probably the single strongest piece of evidence that the Ossoff campaign had against her. After all, what kind of monster openly admits that they don’t want workers to be paid enough to survive? If your opponent says this, you should talk about it constantly. You certainly shouldn’t bury it on the back of a single flyer and introduce it using a strange form of counterintuitive rhetoric in which you announce that people get paid too much and then reveal that they actually don’t. This is not, however, the most unfathomable Ossoff For Congress mailer. That honor has to go to the one with the caption “See something wrong with this picture? 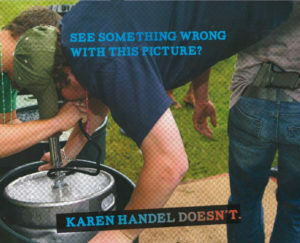 Karen Handel doesn’t…” The viewer is presented with a photograph showing some people in an odd position. It is not immediately clear what is going on. First, we notice a beer keg. Then, we realize that the man suspended above the keg is doing a “keg stand.” Finally, we notice that a man standing next to the keg has a pistol tucked into his jeans. The back of the flyer informs us that Karen Handel believes guns should be allowed on college campuses, and suggests we vote for Jon Ossoff. This “reversal” technique is also deployed on Ossoff’s single worst flyer. This one features a photograph of an open laptop sitting atop a pile of money. 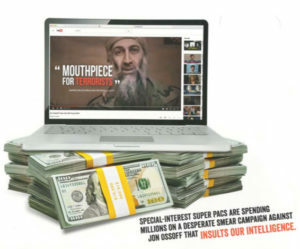 The laptop displays a YouTube video with Osama bin Laden’s face, along with the phrase “MOUTHPIECE FOR TERRORISTS.” A caption informs us that “special interest Super PACs are spending millions on a desperate smear campaign against Jon Ossoff that INSULTS OUR INTELLIGENCE.” On the back, we are told that “Comparing Jon Ossoff’s investigative film work to terrorism is just absurd.” Once again, the main feeling we are left with is one of confusion: why is Osama bin Laden on this flyer? What is the allegation about Ossoff and bin Laden? Apparently, Handel’s negative advertisements had been highlighting documentary film work that Ossoff once did for Al Jazeera, implying it creates some kind of shady Ossoff-bin Laden nexus. The flyer is supposed to counter this smear, informing us that the allegation is ridiculous. But here’s a lesson in political strategy 101: if the first reaction that a voter has to seeing a flyer for Candidate X is to immediately want to Google “Candidate X and Osama bin Laden,” you have produced a bad flyer. The Ossoff flyer actually repeats the ludicrous smear to those who haven’t heard it, before going on to explain why it’s ludicrous. The structure of the ad is: “JON OSSOFF IS A MOUTHPIECE FOR TERRORISTS… is what the Republicans want you to think. But you’re smarter than that!” Like saying “These people are paid too much… is what my opponent thinks” and “Do you think this picture is fine? … No, it isn’t fine at all!”, it takes a circuitous route to its essential point, with most voters probably having thrown the flyer away before completing the process of figuring out what it is trying to say (or having rushed to their laptops to look up why Osama bin Laden posthumously endorsed Jon Ossoff). The “inscrutables” are only one category of Ossoff mailers, though. Many of the rest are focused on encouraging people who hate Donald Trump to vote for Jon Ossoff. One depicts a post-apocalyptic, environmentally devastated landscape covered in gilded Trump properties, asking whether this is the sort of world we wish to bequeath to our children. Others simply show Trump’s face in a contorted or unflattering position (with captions like “Enough.”), as if the mere sight of the president’s flesh will sufficiently motivate voters to head for the polls. The Ossoff campaign’s heavy emphasis on the irresponsibility and repulsiveness of Trump was a somewhat odd strategy, considering that Georgia’s Sixth District had actually voted for Trump, albeit by a small margin. The Democratic Party was relying on Trump-hating voters to be more motivated to defeat Karen Handel (who is not Donald Trump) than they had been to defeat Trump himself. 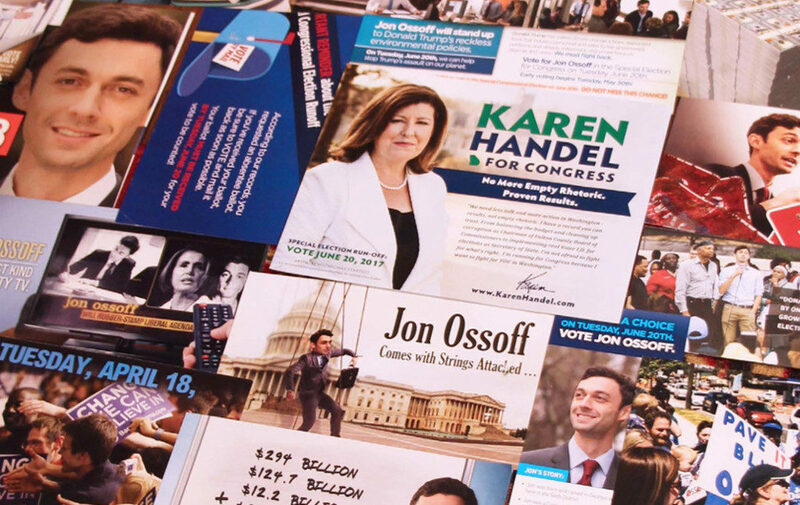 The mailers that actually present a positive case for Jon Ossoff (as opposed to the Trump ones, the baffling ones, and the ones depicting a pleased-looking Karen Handel sitting atop a golden throne as she squanders government dollars on overpriced office supplies) are cautious in the extreme. Many do not actually advocate anything, but simply consist of platitudes, such as “We are courageous, we are humble, and we know how to fight” (“humble” being a curious word to deploy when this phrase arrives printed on a 24-inch glossy fold-out poster). One consists of little more than a picture of Barack Obama, whose vocal inflections Ossoff mimicked in his speeches. Ossoff’s “policy” flyers stick to two basic points: support for women’s health and a seething hatred of government waste. Ossoff presents statistics for the various ways that the government is squandering your money, and promises to implement various GAO recommendations for reducing duplication and overlap in the functioning of federal agencies. The “anti-waste” platform is a strange one in a time of incredible political turmoil around healthcare, the climate, foreign policy, and the economy. But the strategy deployed by Ossoff and the Democratic Party, which comes across strongly in the flyers, was to carefully avoid touching any seriously controversial issues. The theory was that Georgia’s Sixth District was naturally conservative, so Ossoff should stick to opposing Trump and presenting himself as the moderate voice of good government and sensible spending habits. As a result, a disproportionate amount of Ossoff’s paid advertising was devoted to presenting his plans for “consolidating federal data centers” and “eliminating mobile device contracts.” These arcane and comparatively inconsequential policies were hardly likely to get many voters jazzed to go to the polls, but the assumptions underlying the campaign (that presenting Ossoff as inoffensive and blandly handsome was the way to win) meant that it was structurally committed to high levels of vacuity. One might think that incessantly hammering the Pelosi point would seem tedious and desperate. 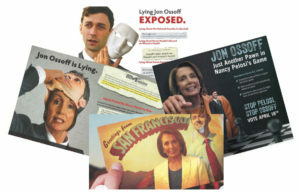 But it’s actually somewhat effective, because it’s presented as part of a clear and unified message, captured in the Handel slogan: “Jon Ossoff Knows Nancy Pelosi… Karen Handel Knows Us.” The flyers generally present damning facts about Osssoff’s weak ties to the district (his huge amount of out-of-state funding, the fact that he doesn’t technically live within the district’s boundaries, his lack of substantive prior experience there), before pivoting and presenting a long list of information about Karen Handel’s history of local activity. 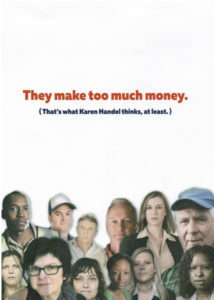 Many contain scans of newspaper clippings critical of Ossoff, plus testimonies from Georgians about Karen Handel’s love of the state and her “homegrown” values. While Ossoff’s flyers throw dozens of things at voters (Trump! Reproductive health! Guns! Waste! Obama! ), Handel focuses on (1) proving that Ossoff was sent by Pelosi and the national Democratic Party to forcibly impose liberal values on Georgians and (2) bolstering her credentials as a longtime public servant who understands and cares about the Sixth District. While both parties spent an ungodly amount of resources on these leaflets and posters, Handel and the Republicans seem to have had a far better sense of what they were actually trying to do with the deluge of propaganda that descended on every unfortunate resident of the Sixth District. Ossoff’s ads seem to have been produced by a team asking the question: “What do political ads typically look like?” Handel’s people, by contrast, seem to have asked themselves: “How do we crush this little worm into the dust?” We can see which approach yields superior results. The Ossoff/Handel propaganda contest reaffirms that Democrats continue to fumble in their quest for an actual message, and for a reason why voters should support their party. Republicans have a very good story, one that has both a positive and negative side: you are hurting, we will fix it, the Democrats caused this, they will hurt you further. Democrats, on the other hand, keep going for: Republicans are bad, while we are competent. Missing are (1) an understanding of voters’ needs and (2) a plan to address those needs. Karen Handel’s flyers promise to expand the military to keep the country safe, to repeal Obamacare in order to improve your health, and to cure breast cancer. (Leave aside, for the moment, what nonsense all of this is.) Jon Ossoff’s flyers promise to implement GAO recommendations for the consolidation of various data-collection facilities at the federal level. Sometimes it barely seems as if Democrats are trying. Of course, it could be that both parties were just wasting their money on this barrage of moronic propaganda. I am not sure how many voters actually modify their choices on the basis of these things, and I’m certainly dubious that sending 40 flyers has a more productive effect than sending 30 or 20. There could, however, be a kind of “Prisoner’s Dilemma” or “arms race” in operation here, where if neither party sent any flyers, the outcome would be the same, but if one party sends a huge stack, they’ll have a better chance, so everyone ends up having to send as many flyers as they can possibly afford to print. This is somewhat unfortunate, since it means that the only ultimate benefit of this exercise is the minor economic windfall it provides to print shops and tree farmers. One should be cautious about taking lessons from this, because the causal links are so difficult to draw. But it is simultaneously true that (1) Jon Ossoff lost by 4 points and (2) Jon Ossoff’s sales pitch was, for the most part, godawful. Could he have improved on that if he hadn’t sent mailers with Osama bin Laden’s face on one side and Ossoff’s face on the other? I cannot rightfully say. But, at the very least, no harm should come from following the principle that your campaign messages ought to say something. Possibly even something substantive and inspiring. It’s just an idea. This article originally appeared in our most recent print edition. 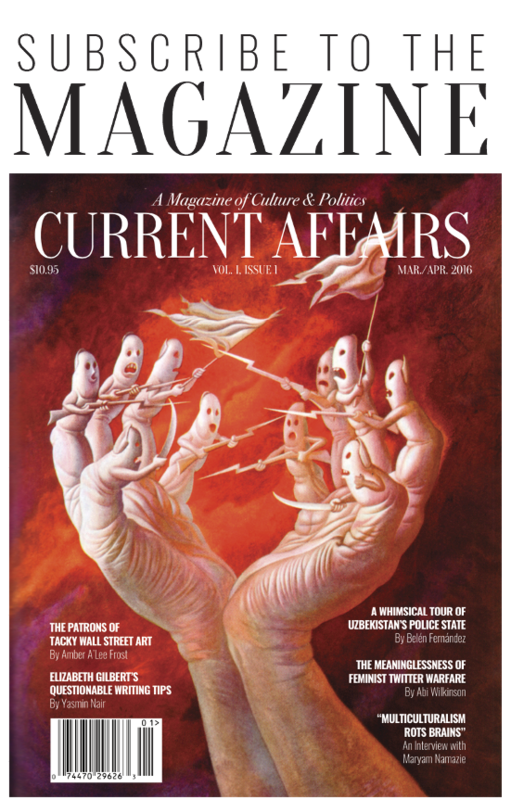 Get your copy today in our online store or by subscribing.